If you have been to Europe you’re likely to be aware that Europeans DO take their vacations and often take them in August. Italians carry it a step further, with a cherished full-scale national holiday every August 15, “Ferragosto.” While Italians celebrate Ferragosto in many ways, the common denominator is rest from work. It’s the culmination of summer for them in a way vaguely like our Labor Day. In fact, some believe that for Italians Ferragosto ranks behind only Christmas, New Year’s and Easter! Ferragosto is built on a solid but evolving tradition that goes back about two thousand years. About 18 B.C., the Emperor Augustus linked various pagan holidays celebrating the end of hard labor in fields to create the “Feriae Augusti,” or festivals of Augustus, from which the Italian word “Ferragosto” derives. Even back then “politicians” didn’t lose a naming opportunity. About the fifth century A.D., August 15 acquired additional significance in Italy and elsewhere when the Roman Catholic Church designated it as the feast of the Assumption of the Blessed Virgin Mary. According to Church doctrine, Mary, mother of Jesus Christ, was assumed bodily into heaven, unlike other human beings. Long after Augustus “created” Ferragosto, beginning in the latter half of the 1920’s, fascists popularized the practice of taking vacations around the Ferragosto holiday. There were even discounted train fares limited to August 13, 14 and 15. 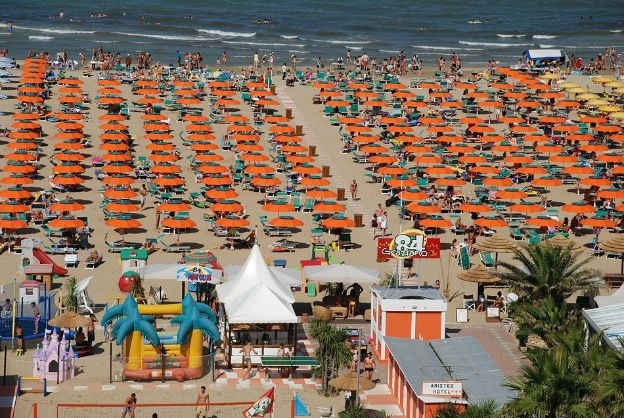 Despite many changes in society, in the 21st century Ferragosto continues to thrive. Its mandate of “R & R” resonates as: families enjoy a traditional Ferragosto “pranzo” (lunch), often a picnic or barbecue; friends enjoy a day at a (most likely) packed beach, perhaps ending with a “falo” (bonfire); youths play with “gavettoni” (water balloons); and couples dance into the evening. Learn more about the culture and language of the home of “La Dolce Vita” by coming to Sentieri events and classes. Fall quarter classes begin on September 17. There’s still time to register! Call 773.275.5325 or register online today. For more information on Ferragosto, please consult these resources, to which we at Sentieri extend a sincere thank you (grazie).